Cast Silver Bar is IRA and RRSP acceptable. . Measuring 32.4 x 67 x 8 mm, 5 oz Cast Silver Bar is cast from .999 fine silver with Republic Metals' logo displayed on top center. Weight, fineness, and Republic Metals' assay mark is located on bottom center. Product is individually heat sealed in plastic and stored in boxes of 25 with foam inserts for protection during transit. 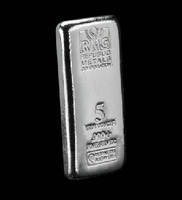 MIAMI, -- Republic Metals Corporation has announced the addition of the 5oz cast silver bar to its line of fine silver products. The 5 ounce cast silver bar, cast from .999 fine silver, is IRA and RRSP acceptable. Republic Metals' logo is displayed on the top center of the bar with the weight, fineness, and Republic Metals' assay mark located on the bottom center. The bar is one of the pioneer bars of what will be a larger line of cast silver products.